FRANKFORT, Ky. (Oct. 27, 2016) – The Kentucky Division of Water (DOW) and the Kentucky Department for Public Health (KDPH) have issued a harmful algal bloom (HAB) recreational public health watch for Briggs Lake near Russellville. The recreational public health watch area includes the entire lake. Water ingested during recreational activities in this lake may increase the risk of gastrointestinal symptoms such as stomach pain, nausea, vomiting and diarrhea. Skin, eye and throat irritation and/or breathing difficulties may also occur after contact. FRANKFORT, Ky. (Nov. 4, 2015) – The Kentucky Division of Water (DOW) and the Kentucky Department for Public Health (DPH) are removing the recreational use advisory for the Markland, Meldahl and Greenup pools of the Ohio River, effective immediately. Results from recent sampling by the Ohio River Valley Sanitation Commission (ORSANCO) indicate the levels of microcystin toxin occurring in these areas of the river are below the advisory threshold for recreating in the water. The removal of the recreational advisory means the Ohio River bordering Kentucky is now free from recreational advisories for harmful algal blooms (HABs). FRANKFORT, Ky. (Oct. 5, 2015) – The Kentucky Division of Water (DOW) sampling results from the Ohio River near the IRONMAN triathlon race course taken on Thursday, Oct. 1 show microcystin toxin levels lower than past sampling events. The test results from around the IRONMAN swim course show harmful algal blooms (HABs) microcystin toxin levels to be below four parts per billion. The threshold for issuing the recreation advisory is 20 parts per billion. A decision by DOW and the Department for Public Health (DPH) related to lifting the recreation advisory will not be made until consecutive tests below 20 parts per billion for microcystin toxins are obtained, and the agencies determine that the likelihood of the area being affected from upstream sources are not significant. A second test showing results below 20 parts per billion would allow DOW to lift the advisory. More testing is scheduled on Tuesday, Oct. 6. FRANKFORT, Ky. (Oct. 2, 2015) – With several thousand IRONMAN triathletes expected in Louisville on Sunday, Oct. 11 for the annual IRONMAN Louisville triathlon, the Kentucky Division of Water (DOW), the Kentucky Department of Public Health (DPH) and representatives from IRONMAN are working together over the next nine days to assess the safety conditions of the Ohio River on race day after harmful algal blooms (HABs) were confirmed in the Louisville area. HABs in the Ohio River prompted a recreational advisory that extends from the West Virginia state line to the Cannelton Locks and Dam located in Hancock County, Kentucky. Because the swim portion of the IRONMAN triathlon takes place in the affected area, IRONMAN and DOW will confirm water test results are within safe levels prior to inclusion of the swim. “We want the swim portion of the race to take place, but only if it’s deemed safe for the athletes as determined through testing and visual confirmation that HABs are at safe levels in the river,” said Eric Atnip, race director for IRONMAN Louisville. Advisory area stretches from Meldahl Dam to the W. Va. line, Little Sandy River near Greenup, Ky.
FRANKFORT, Ky. (Sept. 4, 2015) – The Kentucky Division of Water (KDOW) and the Kentucky Department for Public Health (KDPH) have issued a harmful algal bloom (HAB) recreational advisory for the Ohio River, including tributary confluences from Meldahl Dam to the West Virginia state line. This advisory includes the tributary confluences of the Little Sandy River, Tygarts Creek, Kinniconick Creek and Salt Lick Creek. 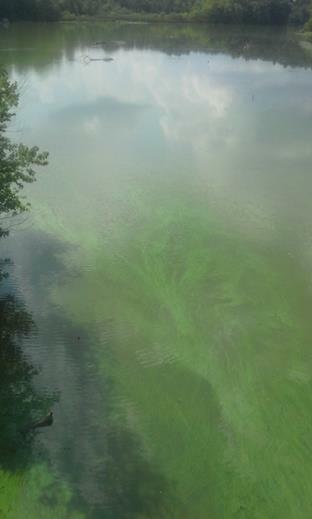 On Aug. 31, KDOW received a report of algal blooms on the Ohio River from Ashland to Maysville and at the confluence of the Little Sandy River and the Ohio River. The Kentucky Division of Water (KDOW) with the Ohio River Valley Sanitation Commission (ORSANCO), Ohio Environmental Protection Agency and West Virginia Department of Environmental Protection are responding to several reports of harmful algal blooms (HABs) on the Ohio River and some of its tributaries. The HABs have been observed between Pike Island Locks and Dam on the Ohio River near Wheeling, W.Va. downriver to Cincinnati, Ohio . ORSANCO first received notification of a green sheen on the Ohio River near Wheeling, W. Va. at the Pike Island Locks and Dam on Wednesday, Aug. 19. A sample of river water was analyzed which confirmed the presence of blue-green algae. As a precaution, KDOW is sampling drinking water intakes at facilities downstream of and in the areas of reported blooms. KDOW is continuing to work with public water systems along the Ohio River to be vigilant in monitoring the water supply.